THORIGNÉ FOUILLARD, France – Nov. 10th, 2017, 08:00 AM CET – Kerlink (ALKLK – FR0013156007), a specialist and global leader in network solutions dedicated to the Internet of Things (IoT), has won the 2017 Best Revenue Growth Award on the EnterNext prize list of the Deloitte/In Extenso Technology Fast 50. The award recognizes fast-growing French technology companies, based on revenue growth during the past four years. Kerlink’s revenue grew by more than 50 percent each year from 2013 to 2016. 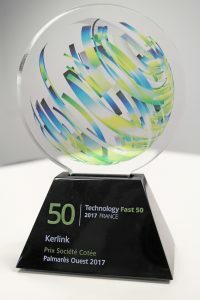 “The Deloitte/In Extenso Technology Fast 50 Award is a great recognition of our financial performance, which results from the Kerlink team’s continuous commitment to excellence in hardware, software and service to our customers,” said William Gouesbet, Kerlink CEO. Since 2001, the Technology Fast 50 promotes and encourages, year after year, the development of companies combining innovation and growth in high technologies. Own patents or spend at least 5 percent of revenue in R&D and be active in one of the following industries: 1) Biotech and Sciences 2) Energy and Greentech 3) Hardware and Electronics 4) Internet, Media and Telecom 5) Software and IT 6) Aerospace & Defense. Reminder: companies in the e-commerce, consulting and training, marketing and communication agencies and design offices that haven’t developed a technology aren’t allowed to participate. Having made revenue of at least €50,000 in 2013.